Need a high-performance stacking solution for working on uneven floors? 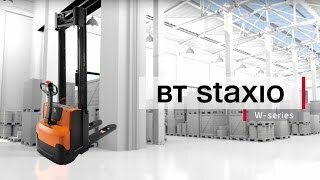 Our BT Staxio W-series with elevating support arms has been designed to allow the operator get on with the job at hand – simply and safely. With excellent visibility through the truck mast and intuitive controls, it can be driven with the handle in an upright position for improved manoeuvrability in tight spaces. The SWE140L comes with elevating support arms to allow use on uneven floors or ramps.